New York, NY – Today the City Council’s Education Committee passed legislation that would measure the number of children from each neighborhood who apply to attend a particular school, the number of seats available at each school, how many offers of admission were made, and total enrollment in all public schools. The bill introduced by Council Member Ben Kallos will also require the Department of Education (DOE) to issue reports on the number of individuals who applied for, received offers for, and enrolled in pre-kindergarten, kindergarten, sixth and ninth grade in DOE schools. The reporting required under the legislation will show the current geographic diversity in NYC schools, whether there are sufficient numbers of school seats in each neighborhood, and how many children are being turned away from the public school system because the City lacks the capacity to allow children to attend school in the neighborhood in which they live. The information would be reported by community school district and by individual school. The information would be disaggregated by grade level, community school district of residence of individuals, primary home language of individuals, and zip code of individuals. “The fact is we need more school seats and we need more transparency from the Department of Education. We have a growing city and the more useful data we can get the better our children will be served,” said Council Member Ben Kallos. “The Mayor’s promise of ‘Pre-Kindergarten for All’ must include enough seats in every neighborhood, including the Upper East Side. Parents in my district are giving up on our public schools and with it our government and parents who can’t afford private school are being forced out." According to records obtained by Council Member Kallos in 2015, 54% of would-be pre-kindergarteners on the Upper East Side were not offered school seats in their zip codes. For the 2017-2018 school year, more than 900 four-year-olds applied for a total of 596 seats available for this school year. A decrease of 22 seats from the previous school year. This means that at least one in three four-year-olds will not be offered a seat in their neighborhood. In 2016, in School District 2, which spans from the Financial District to the Upper East Side, 1,696 preschoolers took the Gifted and Talented exam, 838 of whom were deemed eligible for the program, and 652 applied. However, according to Department of Education, only 346 received offers, leaving 47% of applicants, a total of 306 preschoolers, without access to the coveted program. The aforementioned data for these two programs indicates a larger problem which extends to general enrollment. This legislation seeks the data from the DOE needed to enact changes in order to give the City Council the ability to do so. New York, NY,– Residents at James Cagney Place today, welcomed the news that a section of East 91st Street that has been closed to vehicular traffic for more than 40 years -- and renamed James Cagney Place in 1989 -- was officially recognized as a Pedestrian Plaza under the NYC Department of Transportation’s (DOT) NYC Plaza program Round 10. The award notice came after three years of effort by Community Board 8 Members Rita Popper and Dave Rosenstein, with support from Council Member Ben Kallos, Manhattan Borough President Gale Brewer and in partnership with sponsor Ruppert-Yorkville (R-Y) Management, which helped form Friends of James Cagney Place LLC. In 2017, the Friends of James Cagney Place organized free events including a jazz festival, movie night, Halloween Parade, and the tree lighting to build community support and demonstrate the import of a protected plaza as a community resource. These events are in addition to daily use by residents walking their dogs, seniors enjoying passive recreation, and children sledding on this section of Carnegie Hill when it snows. Completing a five-year effort by city government to improve safety operations for construction cranes, the City Council today passed the Crane Modernization Act Int. 443-A, which requires the City of New York and developers to remove older cranes from operation by limiting how long they can be in service to 25 years. I am pleased that the Spence School, the principals of P.S. 151 and P.S. 527, and the Department of Education have agreed in principal to the common goal of opening a state of the art recreational facility to our local public-school students, and to the stated timeline for doing so. NYC Parks Commissioner Mitchell J. Silver, FAICP, joined State Senator Liz Krueger, Council Member Ben Kallos, Manhattan Community Board 8 197A Task Force Co-Chair Barry Schneider,Manhattan Borough Historian Michael Miscione, and community members to celebrate the completion of Andrew Haswell Green Park Phase 2A construction. "We are rebuilding the East River Esplanade block by block, street by street and park by park," said Council Member Ben Kallos. "The completion of Andrew Haswell Green Park phase 2A represents more open green space for the residents of the East Sixties. Thank you to the New York City Parks Department for their dedication and commitment to getting this park open. East Siders will now be able to enjoy it and its wonderful views of the river"
Int. No. 1701-2017 (Vacca) upgrades the NYC Open Data Law and most importantly requires the City to publish on the Open Data Portal information the status of data sets and makes it much easier for the public to track how well the City is complying with the Open Data Law. 1528-A-2017 (Vacca) requires agencies to list the names of data sets that have been requested via FOIL request. This will make it much easier for the public and the City to understand what data the public is requesting and should be published as open data. New York, NY – Over 538 privately owned public spaces (POPS) attached to 329 buildings that received additional area to build will be required to provide the amenities promised or face steep fines for bad landlords, under legislation that passed the Council today. The legislation is part of package authored by Land Use Chair David Greenfield and Council Member Ben Kallos. In August 2016, Trump Tower Commercial, LLC, was fined $10,000 in violation of their POPS agreement for having an unapproved sales counter in a space designated for the public. The New York Times has highlighted the shortcomings and non-compliance of POPS in 1977, 1987, and 1998 followed by the publication of “Privately Owned Public Space: The New York City Experience,” authored by Jerold Kayden and the Municipal Art Society in 2000. Comptroller Scott Stringer audited 333 POPS finding 275 had not been inspected by Department of Buildings in four years with more than half failing to provide all required amenities in April of 2017. New York, NY– Following a historic low in voter turnout in New York City’s 2017 General Election for municipal offices, the New York City Council Committee on Governmental Operations today passed legislation to implement online voter registration. The legislation is slated for passage by the New York City Council on November 16. Relying on an opinion by New York State Attorney General Eric Schneiderman which allows online voter registration by localities, Council Member Ben Kallos authored the legislation, which will require the City’s Campaign Finance Board to create and maintain a secure website and mobile app allowing New York City residents to register to vote online. Thirty-six states and the District of Columbia offer limited forms of online voter registration according to the National Conference of State Legislatures. New York currently only allows residents with a Department of Motor Vehicles (DMV) driver license, learner permit or non-driver identification to register online. However many residents of color cannot use New York State’s only online voter registration system as Hispanics are twice as likely as Whites to not have identification (10%) and Blacks are more than two and half times as likely as Whites not to have identification (13%) according to Project Vote. New York, NY – How New York City spends $85 billion just got more transparent with the passing of legislation from Council Member Ben Kallos that requires all budget documents released by the Office of Management and Budget (OMB) to be publicly released on its website and the Open Data Portal in a searchable and computer readable format, instead of only printed or in lengthy PDFs. New York, NY- What is for breakfast lunch, and dinner along with how many children actually eat it is on the menu and passing the City Council thanks to legislation authored by Council Member Kallos. The Department of Education will now report on all school meals for 1.1 million public school children and on planning measures to increase participation in programs like Breakfast After the Bell and the newly announced Universal Free Lunch. "Intro 773-B enables us to ensure that the Free School Lunch for All and Breakfast After the Bell initiatives reach their full potential. Given the extraordinarily high cost of living in New York City many families are struggling to make ends meet and school meals guarantee that students have the fuel they need to thrive in school." said Liz Accles, Executive Director, Community Food Advocates. New York, NY – Today, the New York City Council Education Committee passed Introduction 1638,authored by East Side Middle School students, who are representatives to the Manhattan Leadership Council, and introduced by Council Member Kallos and Education Committee Chair Daniel Dromm. This legislation requires reporting on which middle and high schools have a Gender-Sexuality Alliance (GSA) club, the number of teachers, principals, and administrators at each school who have received lesbian, gay, bisexual, transgender, queer or questioning, and gender non-conforming (LGBTQGNC) training. A GSA is a student run club that provides a safe place for LGBTQ students and their allies to meet, have discussions, offer support, and plan events and activities, usually with the aim of raising awareness. According to Advocates for Children of New York, the presence of a GSA in school decreases anti-LGBTQ bullying and harassment and makes students feel safer and more comfortable. Today, the Climate Works for All coalition released its plan to reduce NYC’s greenhouse gas emissions by 12%, by requiring comprehensive energy efficiency retrofits at the city’s large buildings. Buildings in NYC contribute to 70% of the city’s emissions. While Mayor de Blasio has announced a commitment to mandate the reduction of on-site fossil fuel usage in large buildings, Climate Works for All, a broad coalition of labor, environmental justice, faith, and community organizations, argues that the retrofits must go further and include the use of electricity from the grid and central steam as well. The City will only meet its ambitious target to reduce emissions by 80% by 2050 if it requires a whole building approach. I am here today to give testimony in support of the community-led grassroots zoning text change application submitted to the Commission by the East River Fifties Alliance in partnership with Manhattan Borough President Gale Brewer, State Senator Liz Krueger, Council Member Dan Garodnick, and me. ERFA, the community coalition leading this application, consists of 45 buildings, represented by co-op boards, condo boards and individual owners, and over 2600 individual supporters living in more than 500 buildings within and beyond the rezoning area. Thank you to Commission Chair Marisa Lago, Vice Chair Kenneth J. Knuckles, and the members of the City Planning Commission for hearing us today. Thank you as well to your staff, and in particular to the Department of City Planning’s community affairs and Manhattan Borough offices’ professional and dedicated work in handling this application. In the Sutton Area, a small residential neighborhood by the East River in Midtown Manhattan, we have come together to envision a community that welcomes new construction while protecting the rent-regulated tenants who have lived in our neighborhood for decades, like our friends Herndon Werth and Charles Fernandez. We are here to support real housing for real New Yorkers, including affordable housing, instead of 800-foot-high full-story penthouses built to serve as investments, often for foreign speculators. We envision a residential community in the Sutton Area where new buildings serve the needs of the local community and of the City as a whole, adding to our housing stock for working people and fitting the shape and character of our neighborhood. We have seen the super-tall buildings at 432 Park and 111 West 57th Street, and we believe they have no role on quiet side streets in fully residential neighborhoods. When I first learned that the super-tall buildings could creep onto our residential side streets, I wanted to do something that had not been done before: to organize the community to propose our own plan to rezone the neighborhood for the present and the future. That is what we did, led by residents from the Sutton Area and co-signed by four elected officials: we filed the first ever community-led rezoning at City Planning, which we are discussing today. This rezoning corrects an accident of history that has left the Sutton Area the only residential neighborhood in the city with uncapped R10 zoning without any further protections. The proposal seeks to impose tower-on-a-base zoning, which would result in squatter, more human-scale buildings, with a dense base and a shorter tower, adding more units to our housing stock, which will be filled by real New Yorkers. Depending on lot configuration, maximum building heights in tower-on-a-base zoning are estimated between 300 and 500 feet, far closer to the built context of the neighborhood than a super-tall building that would cast a shadow all the way across the East River into Queens. New York, NY — Following an increase in education, safety equipment, and enforcement, bike safety from 30th to 97th streets on Manhattan’s East Side continues to improve as a result of a program led by Council Members Ben Kallos and Dan Garodnick. Since the program’s launch by Council Member Kallos in 2014 there has been a reduction in the number of collisions involving cyclists each year, and fewer pedestrians and cyclists injured in collisions. In a reversal, city planners are assisting a group of neighbors trying to halt ongoing construction of an 800-foot tower across from the luxury high rise where many in the group live. For over two years, the neighbors and a group they founded, the East River Fifties Alliance, has spent more than $1 million drafting an unusual do-it-yourself zoning rule, that could block the tower on East 58th Street near Sutton Place. City Hall and the city’s Planning Commissioner had lambasted the campaign in the past for a misguided efforts to block a single building to protect views at the Sovereign, an 485-foot tall, co-op. But last week, the commission staff released a new zoning proposal by the group and offered support for it. It set an unusual fast-track review process that would enable it to be approved by the commission by Nov. 1, before election day, and by the City Council by mid-November. But at the meeting, Mr. Tuttle acknowledged that the proposed zoning change, which covers portions of a 13-block area east of First Avenue, would only affect a single development site in the foreseeable future: the East 58th Street construction site. Both the developer and the community opponents said it would halt the current project, known as Sutton 58 as it is envisioned. Jonathan Kalikow, president of Gamma Real Estate. which is developing the new tower, warned that this zoning change targeted at his building would have a chilling effect on developers across the city. “This zoning change, if passed, will have really horrific negative consequences for the city of New York,” he said. Mr. Kalikow said he was rushing to try to complete the complex foundation needed for the tall narrow tower before the zoning change could take effect. The new zoning proposal grew out of a meeting in August between planners and elected officials, including the Manhattan Borough President Gale Brewer, who had joined East River Fifties group in submitting the plan. Earlier plans by the group had called for strict height limits. The new approach, recommended by the planning staff, would create a new zoning rule that would force developers on side streets to keep much of the bulk of their buildings below 150 feet and only indirectly cap heights. It would particularly penalize developers like Mr. Kalikow, who obtained air rights from nearby buildings, zoning experts said. The fast-track schedule was made possible after a decision by Ms. Brewer and the local community board to forego hearings on the proposed zoning changes. John Banks, president of the Real Estate Board of New York, an industry group, noted that Ms. Brewer has long been an advocate for more openness in city government and in land-use decisions. A spokesman for Ms. Brewer said she had already held a hearing earlier this year, on another version of the plan. “This process has been skewed from the beginning to protect a well-healed group,” Mr. Banks said. Alan Kersh, president of the East River Fifties Alliance, and a resident of the Sovereign, said the revised city plan is more “flexible” than the height limits his group first proposed. He said it would allow for a building taller than what his group had originally proposed, but much shorter than what the developer planned to build. New York, NY – Hospital for Special Surgery (HSS) President and CEO Louis A. Shapiro joined Council Member Ben Kallos, Co-Chair of the East River Esplanade Taskforce with Congress Member Carolyn Maloney, Manhattan Borough President Gale Brewer, and NYC Parks Manhattan Commissioner Bill Castro for an official groundbreaking on renovations to the East River Esplanade from 70th to 72nd Streets by HSS. 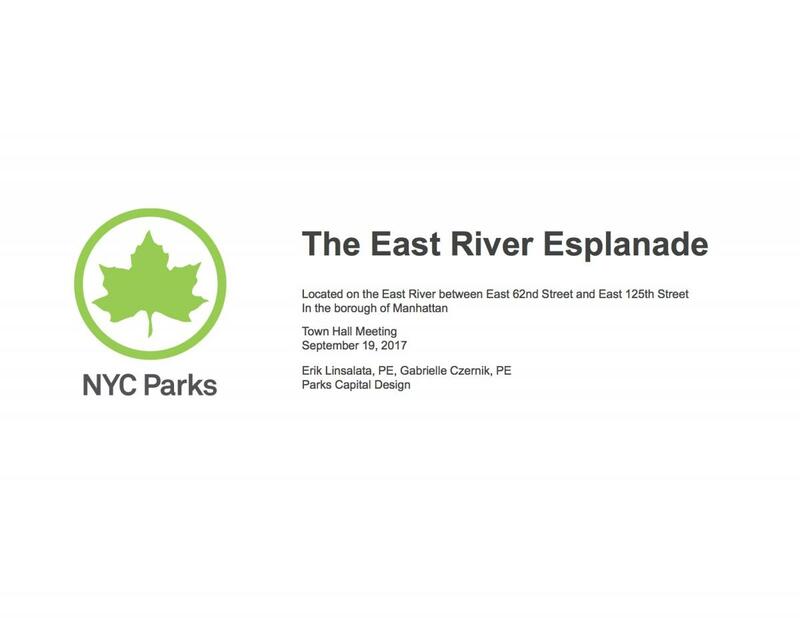 The revitalization and improvements by HSS to the East River Esplanade in this section were negotiated by Council Member Ben Kallos as part of the Uniform Land Use Review Procedure (ULURP) for new construction that was voted on and passed the City Council on July 23, 2015. NEW YORK—As part of City Hall in your Borough week in Manhattan, Mayor Bill de Blasio today announced that the formal design process for a new section of the Manhattan Waterfront Greenway between East 61st Street and East 53rd Street will officially kick off next week. The Mayor was joined by local officials to tour a portion of the existing greenway and discussing plans for its expansion. Construction of the new segment will commence in 2019, with completion expected in 2022. Roosevelt Island, NY - Residents, elected officials, school and program administrators gathered yesterday September 18 at PS/IS 217 to welcome Child Center of NY to Roosevelt Island as the Beacon after-school program provider. In April of 2017, the New York City Department of Youth and Community Development (DYCD) issued a request for proposal (RFP) for providers to offer Beacon after-school programming at the Roosevelt Island school to a growing population of school-aged children on the Island. By mid-summer, DYCD had selected a winner, Child Center of NY. Today the doors to the new Beacon after-school program were opened by Council Member Ben Kallos, Assembly Member Rebecca Seawright and other community leaders including Mandana Beckman Principal at PS/IS 217 where the programming will be held.